We previously learned that carrying capacity, or the maximum number of individuals that an environment can sustain over time without destroying or degrading the environment, is determined by a few key factors. Some factors have the ability to limit a population, or even reduce it. These limiting factors can be abiotic, biotic, density dependent or density-independent. But how do these factors impact carrying capacity in the real world? What is a real example of carrying capacity? Here we’ll explore four examples of carrying capacity to help you better understand the concept in practice. 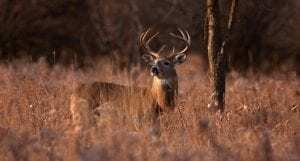 The story of the North American Deer offers a great example of what happens when a habitat’s carrying capacity is exceeded. Before North America was colonized by Europeans, the North American Deer population was kept in check by wolves. Once settlers arrived they began to recognize wolves as a nuisance and danger to their communities so hunted the animals, and wolf populations were severely decreased. As a result of the loss of their main predator, the deer population began to boom. Deer feed on all sorts of plants, trees, shrubs, flowers, and grass, and require large quantities of such vegetation to sustain themselves. Eventually, deer began to starve because their large numbers depleted their main source of food; they had reached their carrying capacity. Overgrazing is another example of carrying capacity coming into play. 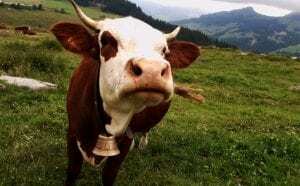 Farmers must be careful to not let cattle overgraze. Once an area is overgrazed it can take a long time for nutrients to return to the soil, and for grasses to regrow. In the meantime, the area has reached its carrying capacity as it can no longer sustain any new cattle. Perhaps the carrying capacity has even been surpassed if the area cannot fully support some of the existing cattle. Space is another limiting factor in carrying capacity – when a species no longer has space to live, the population cannot increase. For this example, we introduce the relationship between barnacles and oysters. Both settle on hard surfaces such as rocky shores. 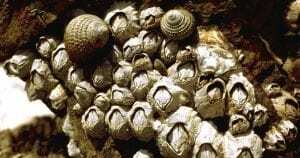 Once there, barnacles compete with settling oyster larvae for food and space. The amount of space on the hard surface determines the carrying capacities of both barnacle and oyster populations. For a human angle, we offer the Irish Potato Famine as an example of carrying capacity in the real world. 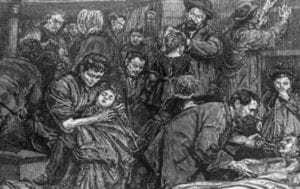 Between 1845 and 1849 a disease called potato blight infected potato crops throughout Europe and mass starvation, disease, and emigration beset Ireland. As a result of the massive loss in the country’s staple crop, the carrying capacity of Ireland severely dropped – it couldn’t support as many people as it once had. Food is one of the most important factors in determining the carrying capacity of an environment and it is difficult to overcome when something like blight hits a food supply. But how this constraint is dealt with can differ between human and wildlife populations. In Ireland, while some people did starve to death, others fled the famine and emigrated to find food. It is this mobility that separates humans from some wildlife or marine populations because we are capable of traveling large distances to find better lives (or, in this case, food).